Dud Hendrick (Deer Isle, Maine) being arrested at Bath Iron Works. Dud went to the U.S. Naval Academy and was an all-American lacrosse player there before going to Vietnam. 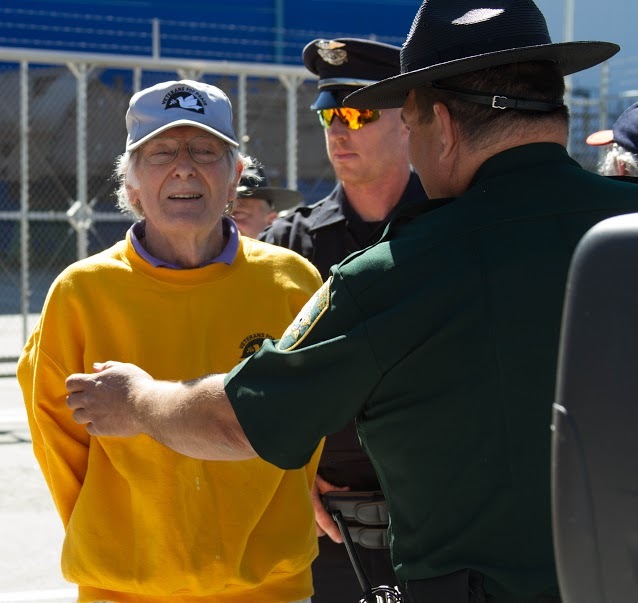 He made a great speech at the rally before we were arrested for blocking the road in front of Bath Iron Works where the $4 billion Zumwalt 'stealth' destroyer was being 'christened'. Dud told about his own conversion of heart - today he is an active member of Veterans For Peace. Would Jesus Christ really bless a $4 billion destroyer or would he want to feed the poor and tend to the sick? Can't we do something better with our friggin money? 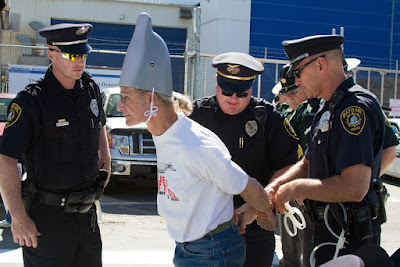 Retired architect Cynthia Howard from Biddeford Pool, Maine being handcuffed and moved to a van for journey to Bath Police department for processing. We were released on our own recognizance and have an August 2 arraignment in local District Court. Vietnam veteran and poet Gerry Kamke suffers from multiple ailments caused by his exposure to toxic Agent Orange during the war. He has been in and out of hospital during recent months but came today and shared his story. Thousands of people were lined up to go into the shipyard for the event and were captive ears for the messages from our speakers and musicians. 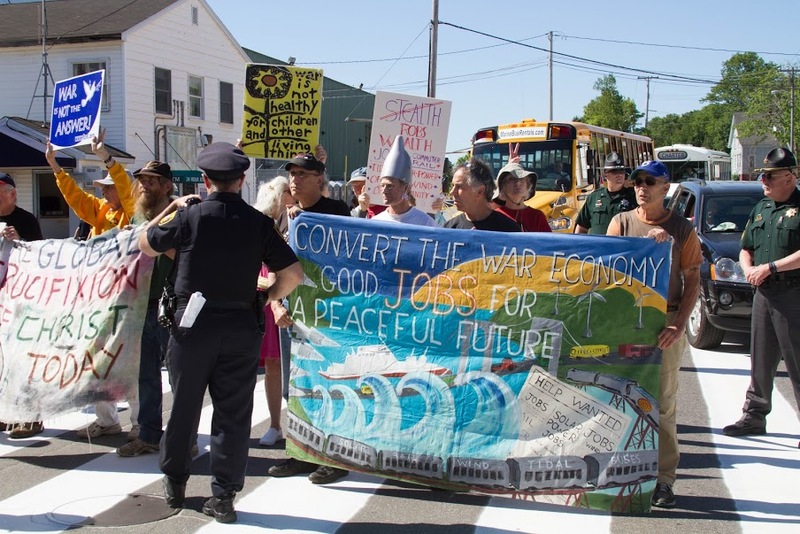 We saw a large number of the crew of the Zumwalt destroyer heading our way so we moved out into the middle of the road and refused to move. Traffic backed up and the crew had to walk right by us. No preaching to the choir today - in fact today the choir was singing in public. Very powerful moments. Jason Rawn (Lincolnville, Maine) has just recently come back from months in Okinawa and Jeju Island. He stood daily with those struggling local people who oppose new U.S. military bases for the Pentagon's provocative encirclement of China and Russia in that part of the world. Jason is also one of our great peace walkers here in Maine. Karen Wainberg is one of our housemates at the Addams-Melman House in Bath. She is now in a nursing home after a recent stroke and surgery. It was inspiring to all of us to see Karen arrive at the event today in a wheelchair. We expect her home soon. 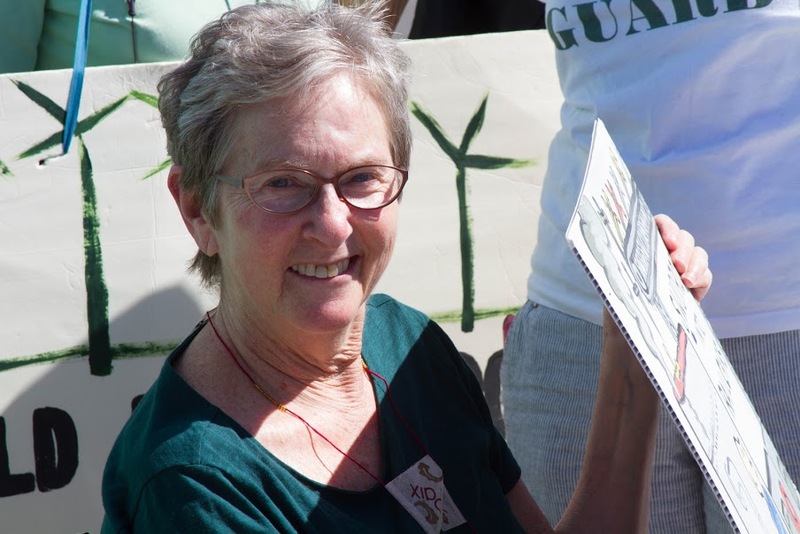 Our intentional community is named after Jane Addams, founder of social work and peace activist during WW I and Seymour Melman, former Columbia University professor who is regarded as the father of the 'conversion of the military industrial complex to sustainable and useful production' movement. 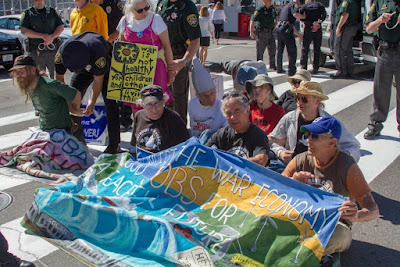 Peter Woodruff (in blue from Arrowsic, Maine) is a recently retired worker from the BIW shipyard. Peter was the first and only worker to ever speak at a shipyard destroyer 'christening' protest. 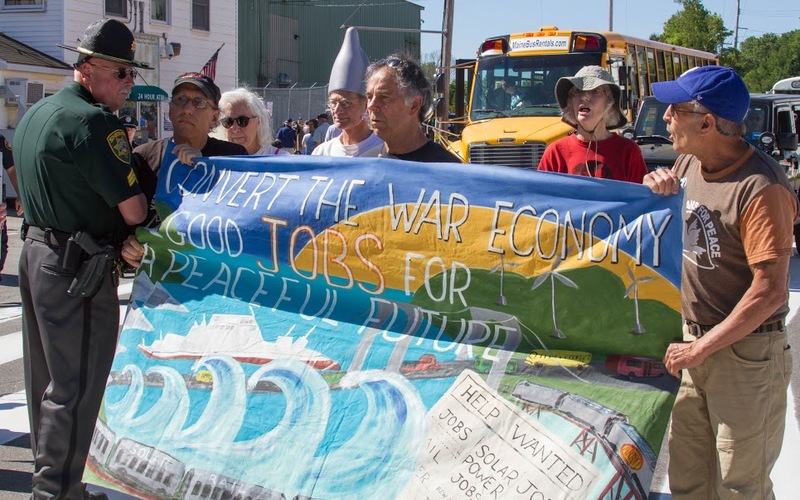 Some years ago he publicly called for the building of offshore wind turbines at BIW and got more than 800 fellow BIW workers to sign a petition saying they supported that idea. He and I did a weekly radio show for six years where we played political music and talked issues. Today Peter can barely talk due to poisoning from the steel dust at the shipyard over the years. 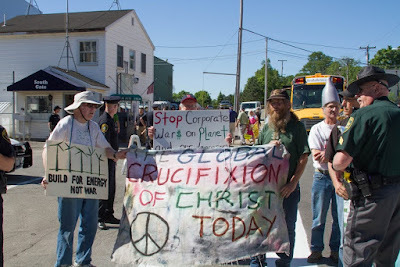 In the background is Pete Sirois (Madison, Maine) also a former BIW worker who now makes political videos and plays them on public access TV stations in his part of rural Maine helping us extend our message to more people. A county sheriff stuck his elbow in my chest trying to get us to move out of the road. He was one of only two cops I saw that went out of their way to be rude to us. All the rest I saw were really kind, low key, respectful and even encouraging. The Bath police department officer in charge told the county elbow thrower to back off. 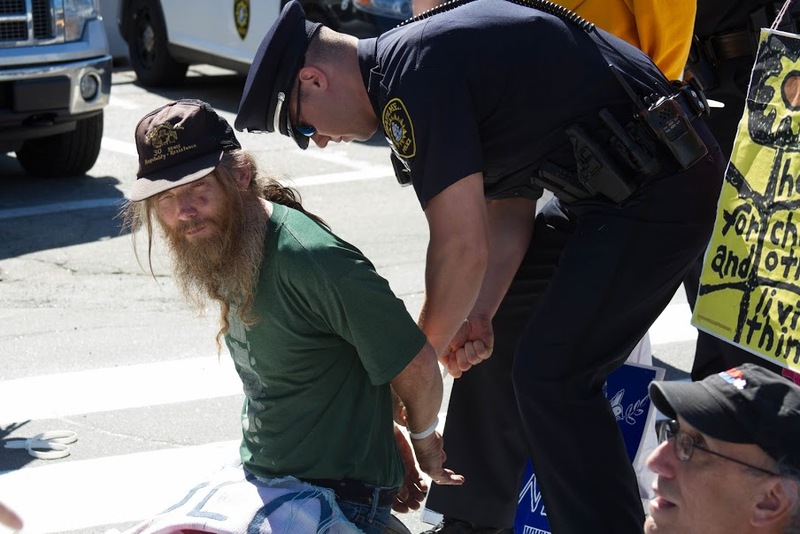 One Bath cop told one of those arrested that "You all are the conscience of the community." That was nice to hear. Our message is indeed getting into the core of the local community. Persistence offers rewards. 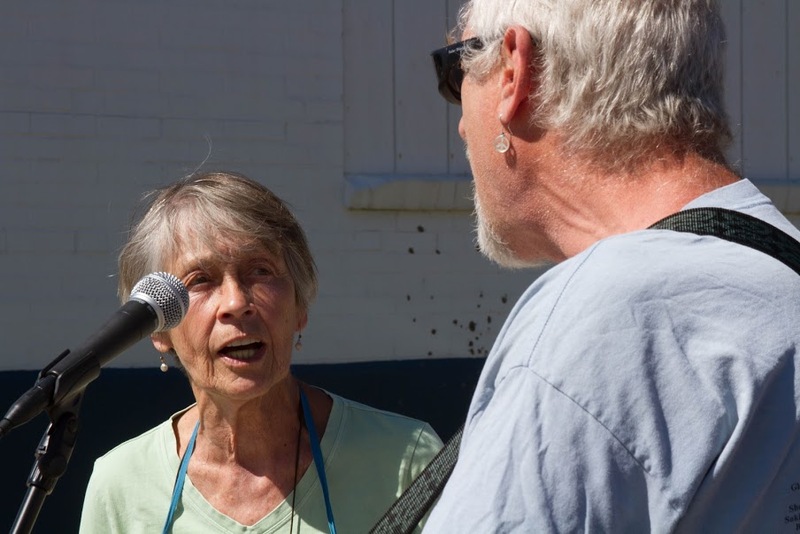 Rosie Tyler (Brunswick, Maine) sings along with Mike Hasty (Berwick, Maine) during the rally featuring speakers and music as the thousands of event goers lined up to enter the shipyard. 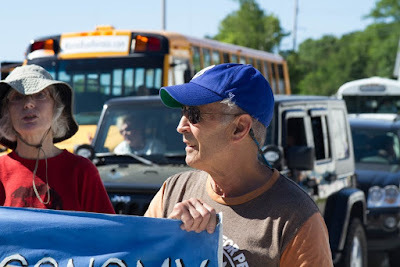 When we were sitting blocking the road I noticed Mike singing one of my favorite union organizing days songs: "We shall not be moved. Just like a tree standing by the water, we shall not be moved." 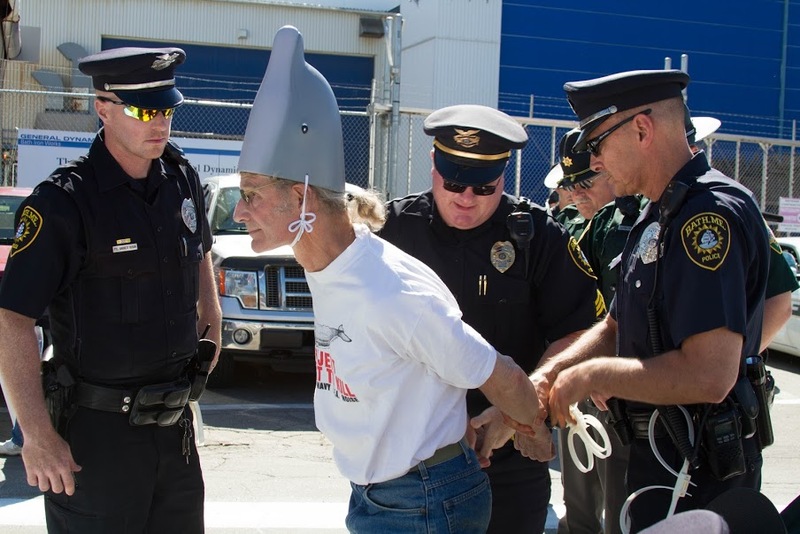 Artist Russell Wray (Hancock, Maine) being arrested with his dolphin head he made for this event. While in Gangjeong village on Jeju Island last December Russell (who is most motivated by wanting to protect sea life from military toxics and sonar) became a fan of the Korean peace group called 'Hot Pink Dolphins' that creatively specialize in teaching fellow citizens about the dangers to sea life of the new Navy base on Jeju. U.S. destroyers made in Bath, along with nuclear subs and aircraft carriers, will eventually be deployed by the Pentagon to the base on Jeju. In order to build the base a 500-year old fishing and farming community has been destroyed and the villagers have gone to prison, lost their lands, and now face an absurd lawsuit by the Samsung Corporation (the lead base construction company). Samsung is demanding that the village of 2,000 people pay them $3 million in compensation for 'construction delays' after their village was stolen by undemocratic means by the Navy. The U.S. Navy sent the specs for the base to the puppet right-wing Korean government and told them to build the base that will port U.S. ships. A complete insult. 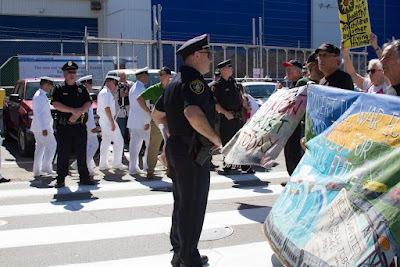 The Zumwalt destroyer crew members had to pass by our protest. We are trying to prepare them for what they will see when they port in Korea, Guam, Philippines, Okinawa, Australia, Japan, Ukraine......the world is fed up with U.S. militarism and 'exceptionalism'. It's time for the arrogance to end before it kills us all. The $4 billion Zumwalt 'stealth' destroyer. 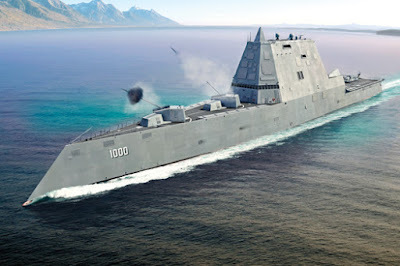 The story is that the Navy didn't actually want the ship because of the cost - it would punch a hole in their ship building budget. Obama forced the Navy to build three of the warships because he owed General Dynamics Corp. (that owns BIW) for helping to make him president. The Crown family in Chicago are majority stock owners of General Dynamics and raised money for Obama to become president. They ran interference for him within the powerful military industrial complex that ended up giving Obama more campaign money than his rival John McCain got. Oligarchy controlled Obama from the start. Tarak Kauff (Woodstock, NY) is a national board member of Veterans For Peace. 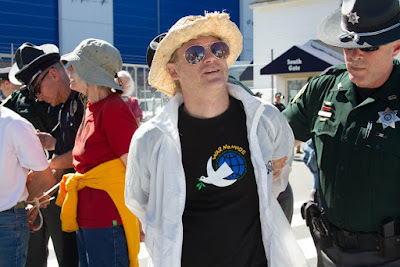 He often comes to Maine to support our events and is co-publisher of VFP's national newspaper called 'Peace in Our Times'. Behind him in red shirt is wonderful activist Connie Jenkins from Orono, Maine. She spoke during the rally about our October 11-26 peace walk through Maine. Sitting in the road and forcing the police to remove us. It was the least we could do. George Kehoe-Ostensen (Hope, Maine) is a longtime Catholic Worker movement activist. He and his wife Maureen have been leaders for years in keeping the ongoing Advent and Lenten weekly vigils going at BIW. 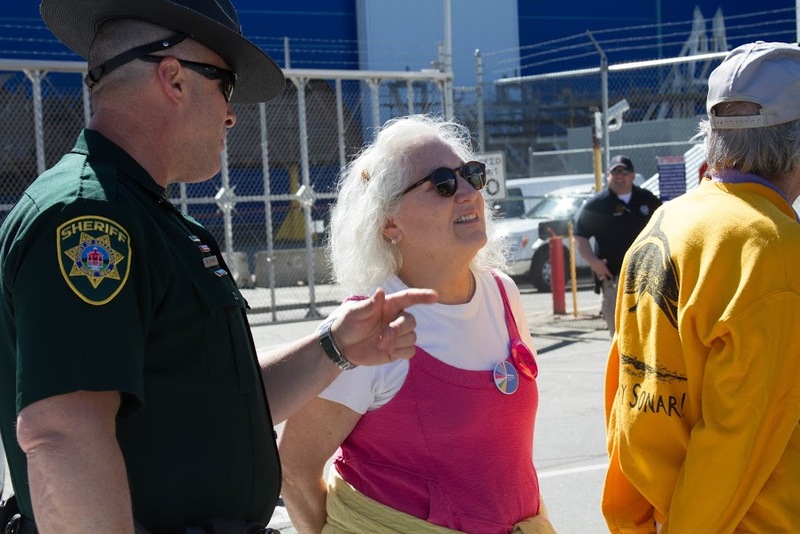 Their high school son Jurgen handed out 100 flyers to those entering the shipyard and also asked to speak during the rally. 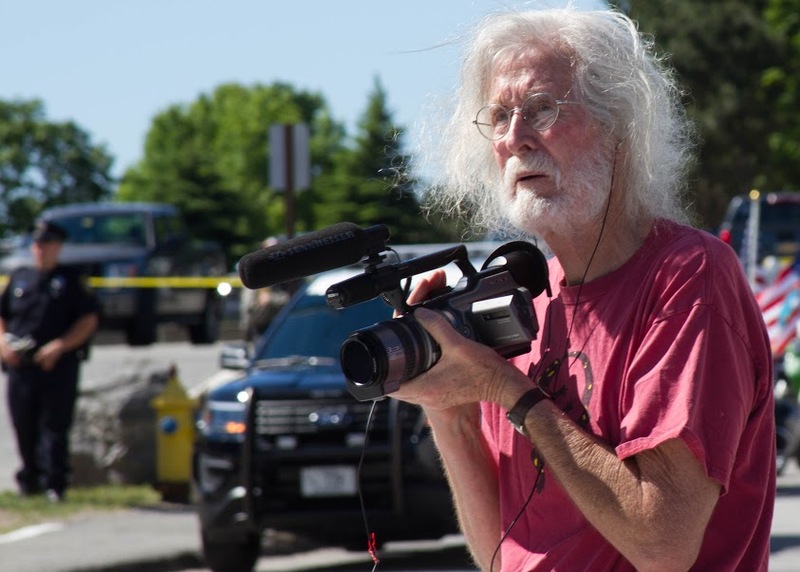 Artist Brown Lethem has been a peace activist since the early 1960's. 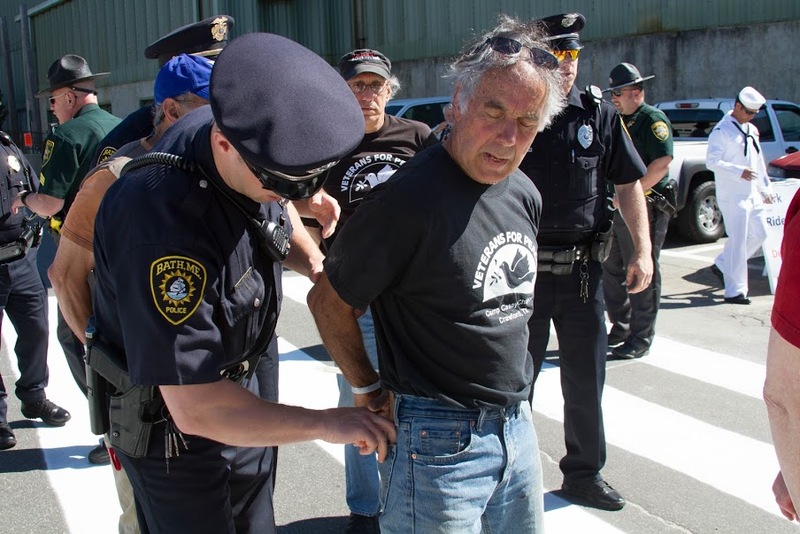 One of the cops overheard him talking about a protest he attended in 1963 at Fort Leavenworth and was amazed that Brown had been at it for so long. Brown is one of our housemates at the Addams-Melman House in Bath. He is also a member of VFP. 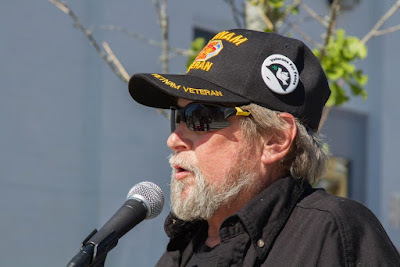 Eric Herter (Brunswick, Maine) is a Vietnam veteran whose life was changed by the war. He comes from an established family in Massachusetts. His grandfather was former Speaker of the House in Congress and governor of their state. Eric was sent to Harvard to follow in the family foot steps. After the war he went another direction and became an AP filmmaker and moved to Vietnam where he reported for that media outlet. Eric is making a video about the event today. Thank you Bruce, fantastic report and thanks to Regis for the excellent photos. Both are very powerful and meaningful. Sharing so that others may read and see another perspective that the corporate media seldom mentions. There is a military-industrial-congressional-media-university complex. 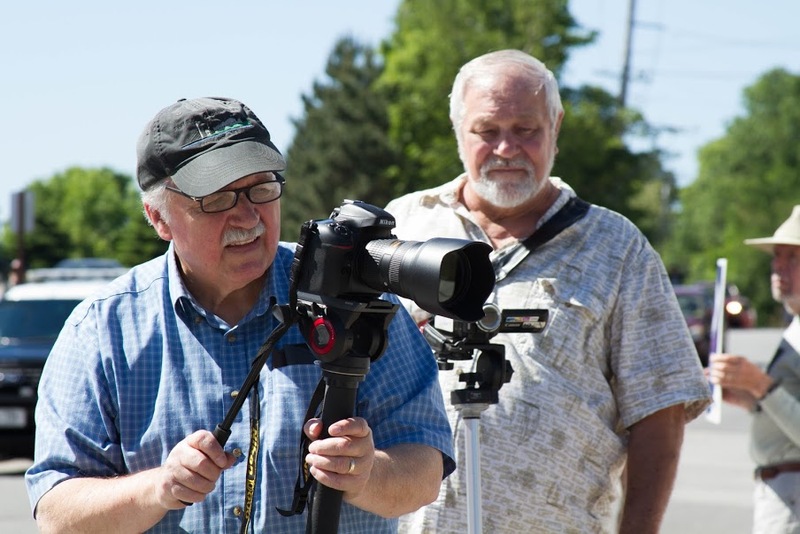 Thanks for posting, Bruce and Regis, and introducing the people who made a stand today. Many support you from around the globe! Thank you, Bruce Gagnon, and Regis. I am grateful to you and your fellow Americans for your courageous peace campaigns for none of us can survive a thermonuclear war. I am so pleased to hear that most of the US cops in that part of the US were supportive and sympathetic for your cause; apart from the two nasties. I hope no one was hurt. We're all most concerned we might be on the brink of war… it's all building up, even as the Olympics is being blighted with a ban on Russian participation that dashes the hopes of many of its athletes. I hope many more people will make their governments know that we do not ever want any wars so who are they fighting for? Peace and everlasting peace on earth. With you in spirit and love. I can believe your analysis of Obama's pressure to force the Navy to purchase a ship built by General Dynamics. However, General Dynamics runs Electric Boat builder of Trident Submarines. Help me understand what were deciding factors that would lead to this particular contract at Bath Iron Works.